The Linksys Smart Gigabit Switch (LGS308, LGS308P, LGS308MP, LGS318, LGS318P, LGS326, LGS326P, and LGS326MP) offers a quick and easy solution to extend your office network. You can reset the switch to factory defaults through its web-based setup page or by manually pressing the reset button on the device. Using a pin, press and hold the reset button for more than 10 seconds. NOTE: The SYSTEM light will blink fast when the switch is ready to reset to factory defaults. The switch will restore its configuration to factory defaults and restart itself. Click Reboot in the left panel. 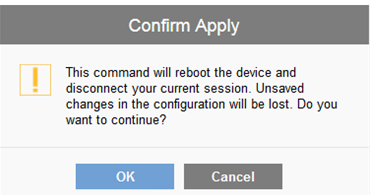 Select Yes on the Restore to Factory Defaults option, then click Reboot to reset the switch to its default settings.